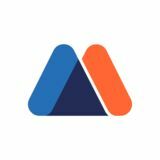 â&#x20AC;&#x153;Global Automotive Electronics Market report includes in-depth analysis of industry by recent technologies, trends, opportunities, challenges, key players and business strategies considering types, segment and future outlook.â&#x20AC;? Several original equipment manufacturers (OEMs) are spending heavily for research & development to manufacture high performing products at reduced cost and develop energy storage technologies. 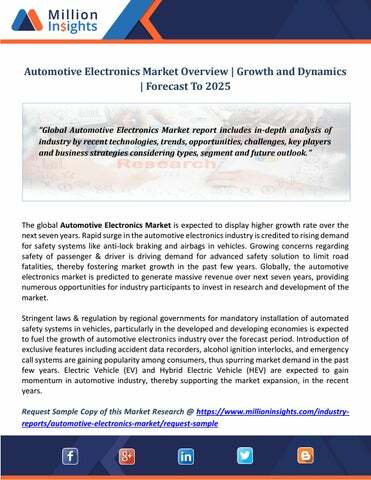 In addition, integration of automation in various stages of manufacturing and increasing dependency on electronics for advanced safety solutions are anticipated to stimulate the market growth of automotive electronics over the next seven years. The automotive electronics market is broadly categorized into five major segments based on the end-use application type such as ADAS (advanced driver-assistance systems), infotainment, body electronics, safety systems, and power train electronics. The ADAS (advanced driverassistance systems) segment is growing rapidly in the automotive electronics industry with substantial revenue generation in the last few years. Growing popularity of automotive electronics in the ADAS (advanced driver-assistance systems) segment is attributed to the increasing invest by leading automobile manufactures. Browse Full Research Report @ https://www.millioninsights.com/industry-reports/automotive-electronics-market The automotive electronics market is divided by region as North America, Europe, Asia-Pacific, Latin America and Africa. North America has shown major growth in recent years owing to the rise in the implementation of latest technologies in automotive sector, swift increase in sales of automobiles, surge in number of research & development activities and existence of wellestablished industrial infrastructure in the region. In European region, Germany, France, and United Kingdom are projected to witness steady growth due to presence of leading automobile manufactures and development of advanced security solutions for next generation automobiles. Asia-Pacific region is estimated to hold major market share in automotive electronics with massive growth in forecast period. Countries such as India, China, Japan and Singapore are leading the Asia-Pacific market with rapid growth in automotive sector, favorable government policies to promote adoption of advanced security features, rising per capita income, and significant investment by leading industry players considering potential growth opportunities in the region. The key players in the automotive electronics industry are Continental Corp., Robert Bosch GmbH, Autoliv, Inc., Samsung Group, Inc., Delphi Technologies, Inc., Denso Corp., and ZF Friedrichshafen AG.